OpenNebula 5.6 ‘Blue Flash’ is Out! The OpenNebula team is proud to announce a new stable version of the leading open source Cloud Management Platform. OpenNebula 5.6 (Blue Flash) is the fourth major release of the OpenNebula 5 series. A significant effort has been applied in this release to enhance features introduced in 5.4 Medusa, while keeping an eye in implementing those features more demanded by the community. A massive set of improvements happened at the core level to increase robustness and scalability, and a major refactor happened in the vCenter integration, particularly in the import process, which has been streamlined. Virtually every component of OpenNebula has been reviewed to target usability and functional improvements, trying to keep API changes to a minimum to avoid disrupting ecosystem components. In this release several development efforts have been invested in making OpenNebula even better for large scale deployments. This improvements includes both, changes in OpenNebula core to better handle concurrency as well as refined interfaces. 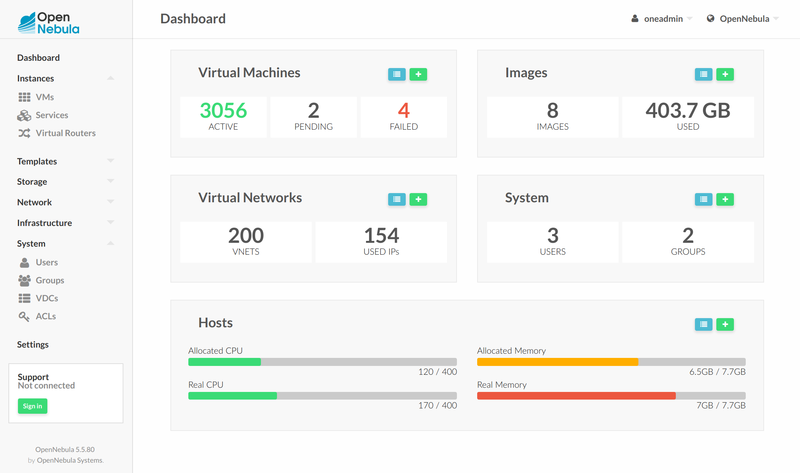 Sunstone dashboard has been redesigned to provided sensible information in a more responsive way. Sunstone also features some new styling touches here and there, and it has been updated to version 5 of Fontawesome. Blue Flash also includes several quality of life improvements for end-users. In particular, it is now possible to schedule periodic actions on VMs. Want to shutdown your VM every Friday at 5p.m. and start it on Monday 7p.m. just before work… We got you covered. Also, don’t to want accidentally terminate that important VM or want to freeze a Network; now you can set locks on common resources to prevent actions to be performed on them. 5.6. ends the major redesign on the vCenter driver started in 5.4. The new integration with vCenter features stability and performance improvements, as well as important new features like a extended multicluster support or a redesigned importation workflow with new Sunstone tabs as well as a new CLI. New integrations also bring Docker management. Any OpenNebula cloud can import from the marketplace a VM prepared to act as docker engine, allowing the deployment of Docker applications on top. Also, an integration with Docker Machine is available to seamlessly manage docker engines without having to interact with OpenNebula APIs or interfaces. Following our tradition this OpenNebula release is named after NGC 6905, also known as the Blue Flash Nebula, a planetary nebula in the constellation Delphinus. It was discovered by William Herschel in 1784. OpenNebula 5.6 Blue Flash is considered to be a stable release and as such, and update is available in production environments. The OpenNebula project would like to thank the community members and users who have contributed to this software release by being active with the discussions, answering user questions, or providing patches for bugfixes, features and documentation. The SetUID/SetGID functionality for VM Templates is funded by University of Louvain. The Ceph drivers enabling VM disks in the hypervisor local storage are funded by Flexyz B.V.
https://opennebula.org/wp-content/uploads/2018/11/opennebula_cloud_logo_white_bg-4.png 0 0 Tino Vazquez https://opennebula.org/wp-content/uploads/2018/11/opennebula_cloud_logo_white_bg-4.png Tino Vazquez2018-07-16 11:48:392018-07-17 11:16:58OpenNebula 5.6 ‘Blue Flash’ is Out!